AlanvDotOrg is my personal website. It grew out of the Shadow and Gilder Shrine into a portal site encompassing different sections for my interests. The website is written in Notepad in PHP, and the images are created in Photoshop. The website was grew out of the Shadow and Gilder Shrine. The PSO TCG was originally a part of the shrine, but I moved it to its own section since I could now make subdomains. The third section was the journal, which started as one of my English assignments. Since I was finally able to fully realize my crative potential with all the new storage space I had, I added a section for photos. Randomjunk was next, which was created just for all the random junk that I had and wanted to share. Then came "Dead Baby," my webcomic. The PPA TCG website (now defunct) was created as a suppliment to the card game, a fundraiser for my school yearbook. Since then, new sections -- such as my CMU (Carnegie Mellon Univeristy) page, a SS card game, and a bunch of other pages -- have been created whenever I have a new project. My journal (on its second iteration), and my photos site (also on its second iteration) are now the main sections of the website, and are updated the most frequently. Most of my side projects nowadays are card games, a mostly-up-to-date list of which can be seen at my TCGs site. That's pretty much it. If you're interested in a history of (almost) all the websites I've ever designed, click here. This domain is my first domain ever, so you have no idea how excited I was to get it. It was first hosted by PinchPenny. A friend recommended them to me, and I found their prices and customer support amazing (I actually passed up several better deals to stay with PP). However, that wasn't to last. After a few months of dwindling support and problems (most of which weren't their fault), I felt I needed a more stable host, since I couldn't risk losing all my files to a server failure, as some had. On May 10, 2004, I switched to HostAffection, but quickly switched back on May 12 when the server move went awry. After a few more months on PP, on August 20, 2004, I transferred to Total Choice Hosting. After being with them for over 7 years, I'm reasonably happy and don't have plans to move away. Anyway, I registered the domain on Friday September 26, 2003. The site went live on Monday, September 29, after 7 years of jumping around various webhosts. Name any free (or previously free) host, and I've probably tried it. Geocities, Angelfire, mg2, Tripod, Prohosting, Spaceports, Nelie, Topcities, host.sk? All check. After 7 years of banner ads, deleted files (and accounts), splitting websites up between four hosts, and never having enough space, I had finally had enough. The domain name is pretty self-explanatory: first name, last initial. I actually had the site logo (not the one above; the one on the splash v1.0) done before I registered anything. I would've liked to be alanv.com, except that domain is for sale at $250. I don't know about you, but I'm not going to pay that much for a domain name. Luckily, alanv.org was still available, and I grabbed it. AlanvDotOrg is currently on its fourth iteration. The first version of AlanvDotOrg was a simple, static HTML site that was more of a portal than anything. Its goal was to show all the different sections on the site. This later expanded slightly to include pages like polls and credits as I started learning PHP. The second version of AlanvDotOrg was the introduction of the updates blog on the main page. This was built around Movable Type, which was responsible for generating the content into a form that was then parsed by the PHP backend. This was written in Thailand (sometimes in a car between places). 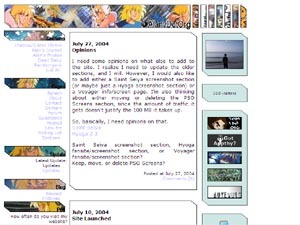 I soon discovered that I liked creating layouts and ended up modifying the layout a few times. AlanvDotOrg v3.0 was my solution to wanting to create new layouts all the time. This version was basically a rewrite of the backend to support skins, and eventually ended up with 16 different skins. After a while, I rewrote the backend, leading to AlanvDotOrg v4.0... basically the same visually as v3.0, but with the ability to syndicate content over from my subsites (such as my journal and photos site). This version displays it on the front page to make it more of a "portal". What you are currently using is AlanvDotOrg v4.1. It's the same code as v4.0, but the new skins focus on a simpler splash page with a blurb and links to relevant sections rather than sticking tons of content on the page. Back when guestbooks were a thing, the site had a couple different ones. You can view the old one here or the even older one here.